CPU Water Cooling running to high? Thread: CPU Water Cooling running to high? I have had my new PC for about 3 months. I was not bothered about the temps and never really looked into until recently, it seems my core temps for my quad core all run high, is this the correct temp or should I be worried? I think the GFX card runs this high anyway because it came already overclocked. Can you recommend to me, what I should do if these are not running right, Thankyou. The simple answer is that the watercooling isnt up to it. Cheap watercooling will generally give you temps similar to air cooling. Specific quad core blocks have a larger cooling area. You probably need a backplate to stop the motherboard bending. Personally, if you are running the CPU at stock speeds and voltages, then yes, you should be a bit worried, thats quite high. Have a read of the quad core thread in my sig. whats the specs of the watercooling setup? Woah, that's all pretty damn hot. An OCed 8800 ultra and core2quad are enough to warrant top of the range watercooling, triple rads kinda thing. Ok, so from what i've read on SCAN, this system only has a dual rad. How about buying another dual rad and adding that to the loop? Last edited by Million; 06-08-2007 at 11:24 AM. SO you are saying the cooling in the system is not good, should I contact SCAN who I brought it from as I still have 9 month warranty, or should I buy a better water block like this D-Tek FuZion CPU Block as recommended in Clunk's post, and fit it myself. I have no problems with stabilty, everything runs as it should and it never crashes, although im thinking the system will probably die in a year or so if the cooling is not improved. I have no experience with water cooling, I never fitted my own water system, is it easy? or should I replace all the water stuff and go back to Air, and replace the stock cooler on the Ultra also. I'm saying that built in watercooling, is generally of a low quality. It was never designed to work with a quad core CPU, and an overclocked CPU will just overwhelm it. It all depends what you are trying to do. If you want a silent, overclocked system, then watercooling is your best option. You need to let us know if you will be overclocking the CPU. how big is the res? is it 120.1 or 120.2? It's what came with the case. Last edited by wozzawozere; 07-08-2007 at 11:44 AM. Ahh you found it, not the sausage. No, I have no need to overclock it, I just saw it and thought why not water cooling sounds cool. 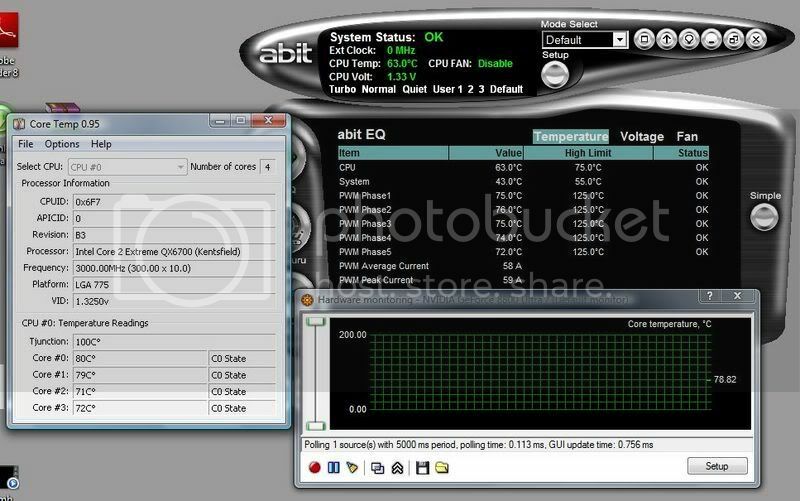 So what do you suggest, I will add an image to show you the temps. whats the radiator? 120.1 or 120.2? 8mm id tubing, is it push-fit or barbs? Well, you could try a backplate first, they can drop the temps by a good 10-15c. Does the waterblock screw on or is it push clips? The plate that sits on the cpu is square, it often moves about and I have had to put 2 pieces of plastic under where it rests,otherwise overtime the pipe on the right pushes it over to the left. As in its not sitting right in the middle of the CPU. Like I say I have no idea about water cooling, maybe they move abit freely because it's set inside a cage like thing with room for the resting plate to move, If only I could take a picture. It screwed onto the motherboard. cpu running at wrong speed! would this work for water cooling?